KFB and some county Farm Bureaus used the annual “Food Check-Out” promotion to remind consumers of how they benefit from the work of farmers. 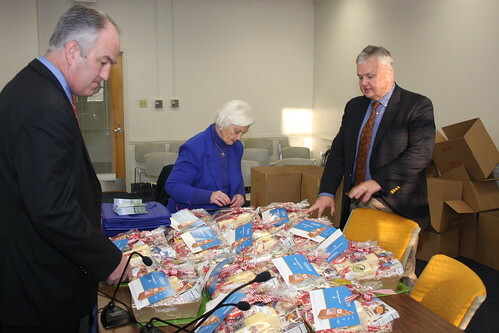 KFB Women’s Committee Chairperson Betty Farris assembles “Food Check-Out Day” baskets along with KFB’s Scott Christmas (left) and L. Joe Cain. “Food Check-Out Day” was initiated 18 years ago to put a spotlight on the low cost of food in the United States. KFB uses the occasion to also show appreciation to state lawmakers for their continuing support of our agriculture industry. KFB staff distributed gift baskets of Kentucky products to legislators and other state officials. KFB Women’s Committee Chairperson Betty Farris of Butler County greeted the legislators and explained the purpose of the event. Meanwhile, dozens of County Farm Bureaus conducted activities such as distributing information at supermarkets and through local media.